【IR Sensor Control】First, you can press the top button to turn on the headlamp and press the button on the side to activate the sensing function. After ,just need to wave hands at 20cm in front of the headlamp to choose on/ off the flashlights. 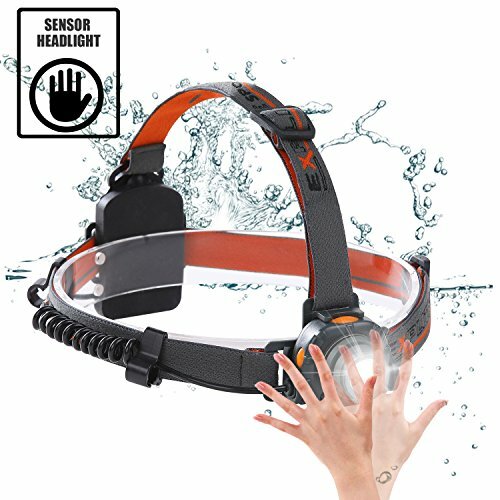 【45 Degree adjustable Head】You can get any lighting angle you need by control the 45° Rotatable Head,Whether you\'re looking closer or farther away, looking up or down. 【SUPER BRIGHT】200 lumen Cree XP-E LED light, LED bulbs a range of 328 feet.100% brightness continuous lighting for up to 5.5 hours, 30%brightness up to 9 hours. 【Multi-purpose】 Hands-free LED flashlights best for Running, Bicycling, Hiking, Camping, Hunting, Fishing, Reading, Working, Cave Exploration. The switch, lamp, wire, and battery box are all waterproof, making sure you can use it in a rainy day. 【Guarantee】Always provide our customers with the best service. If you have any questions about our products, please contact us. We will refund or send a replacement as soon as possible. Darn, this is the coolest head lamp we have.